You asked me the other day to write something that would encourage you to be faithful to your daily Eucharistic adoration. Here then are a few thoughts that came to me while at prayer. I share them with you simply, as one priest to another. When you come into Our Lord's presence to adore Him, and when you prefer Him to the countless other things that solicit your attention and make claims upon your time, Jesus is consoled and glorified. The proof of friendship is the choice of one's friend over all else. Our Lord wants you to prefer Him, to give Him time that could be given to other persons and things. In so doing, you will show Him your love and offer Him the consolation of a true friendship. The Lord Jesus asks this preferential love of all His priests. Friendship, if it is to thrive, must be practiced. This is as true of friendship with Our Divine Lord as it is of human friendships. Jesus waits for the companionship of His priests. With them He holds His priesthood -- and His victimhood -- in common. This is what makes the friendship of His priests so precious to His Sacred Heart. With us priests Jesus shares the purest joy of living in the presence of His Immaculate Mother and of experiencing her maternal care in all the circumstances of priestly life. Given that friendship is based on treasured things held in common, Our Lord's friendship with His priests is unlike His friendship with other souls. The more we priests come to Him and linger in His presence, the more will He share with us the secrets and the treasures reserved for us in His Sacred Heart. We priests are sometimes fearful of finding ourselves silent and alone in Our Lord's presence. When we come to adore Him and to offer Him the consolation of our company, He doesn't require that we speak to Him; it is enough that we remain in the radiance of His Eucharistic Face, allowing our hearts to go out to His Eucharistic Heart. If you have experienced this movement -- this leap -- of the heart to His Eucharistic Heart, and I trust you have, you will know of what I speak. Words are not always necessary. The engagement of the heart, on the other hand, is indispensable. Weariness and fatigue are no obstacle to a fruitful time of adoration. They are incidental; what matters is the desire to seek the Eucharistic Face of Jesus and to abide in His company. For one who loves, the time in Our Lord's presence passes quickly, storing up immense treasures of merit for souls. If you are offering your adoration in reparation and intercession for our brother priests, Our Lord considers the merits of your adoration as belonging to the neediest and most broken among them. Is that not the meaning of the prayer by which we begin our adoration here at the monastery? hidden in this, the Sacrament of Thy Love. for us (Hb 7:25). Amen. Father, you will not see in this life the good done to the souls of Christ's beloved priests, our brothers, by your fidelity to adoration, but in heaven it will be revealed to you, and this revelation will cause you an indescribable increase of delight in His presence. Be the adorer of Jesus' Eucharistic Face, and draw other souls, those whom He will send you, into its radiance. Thus will your priesthood bear fruit, fruit that will last. Just Beautiful Father Mark! I'm sure I can take on board some of those words for myself as well. Father, you write about experiencing a leap in the heart toward His Eucharistic Heart...Could I tell you that I think I know the movement ? 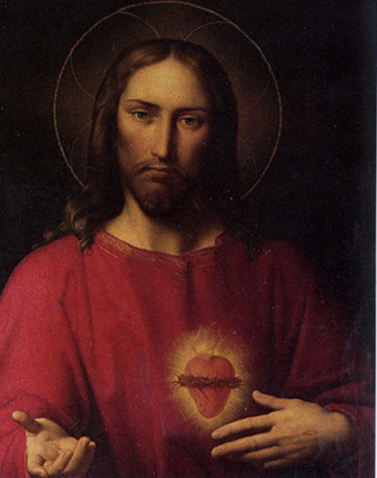 It's like your heart would like to leave you, to go resting inside His Merciful Heart. And, I also think, that it actually does go. In this week, we specially pray and adore for all priests. We want to wash their feet with Jesus as the Lord ask in John 13. Spiritually we join you and your prayer and we put in Merciful Heart of Jesus and Immaculate heart of Mary.